Form 3991 or the "Gas Turbine And Diesel Electric Generator Report" is a form issued by the Michigan Department of Treasury. The form was last revised in November 1, 2017 and is available for digital filing. Download an up-to-date fillable Form 3991 in PDF-format down below or look it up on the Michigan Department of Treasury Forms website. This form is issued under authority of P.A. 206 of 1893. Filing is mandatory. Failure to file is punishable by fine and/or imprisonment. The attached original cost multipliers are for use with the depreciated reproduction cost approach to value. 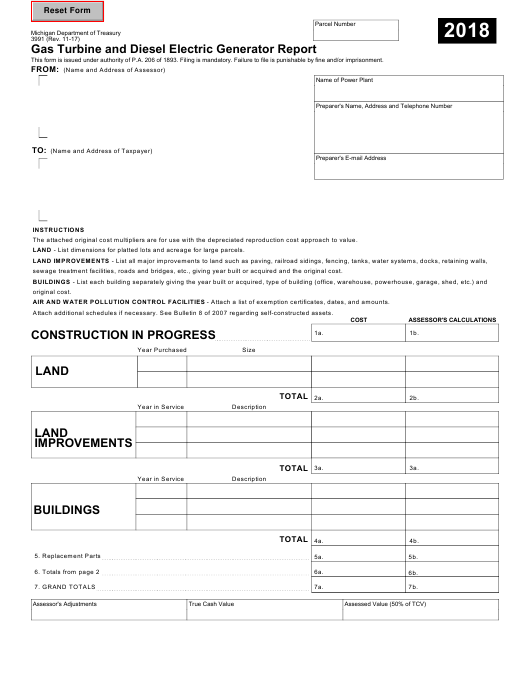 LAND - List dimensions for platted lots and acreage for large parcels. sewage treatment facilities, roads and bridges, etc., giving year built or acquired and the original cost. AIR AND WATER POLLUTION CONTROL FACILITIES - Attach a list of exemption certificates, dates, and amounts. Attach additional schedules if necessary. See Bulletin 8 of 2007 regarding self-constructed assets. COST TOTAL (for page 2). Taxpayer: Add Cost Total of Table 1 or 2, as applicable. Enter total here and carry to line 6a on page 1. TRUE CASH VALUE TOTAL (for page 2). Assessor: Add True Cash Value Total of Table 1 or 2, as applicable. Enter total here and carry to line 6b on page 1.
approach to value. These tables account for physical deterioration and normal obsolescence. They do not account for extraordinary obsolescence. The above diesel multipliers are not to be used in those instances where gas turbine units are not feasible because of insufficient supplies of natural gas. should consider a further valuation allowance not to exceed 50%.